When you have to park your stand bag up that it’s facing into the wind in order to keep it from being blown over, you know you’re n Scotland. At least today was sunny – though a bit on the cold side. But that wind – wow. A sliced tee shot riding the wind today had no chance of being found in Machrihanish Golf Club’s healthy rough. Still, a brilliant day on a course that’s always been one of my favorites in all the world. 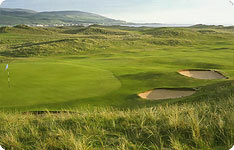 The Golf Road Warriors were truly blessed to be playing Machrihanish on such a “fresh” day. 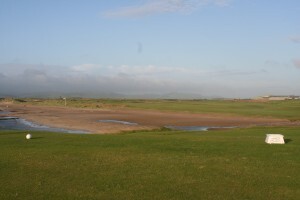 Machrihanish Golf Club is perhaps most famous for its exceptional first hole, which requires your round’s opening shot to carry a corner of the frothing Atlantic – or beach, depending on the state of the tide. It‘s a tough start, particularly into a breeze. Today, the wind was out of the left off the sea, making the hole play very difficult. This windswept beauty of a course is set in wonderful dunes in the small village of Machrihanish, which is situated on the western side of the picturesque Kintyre Peninsula. 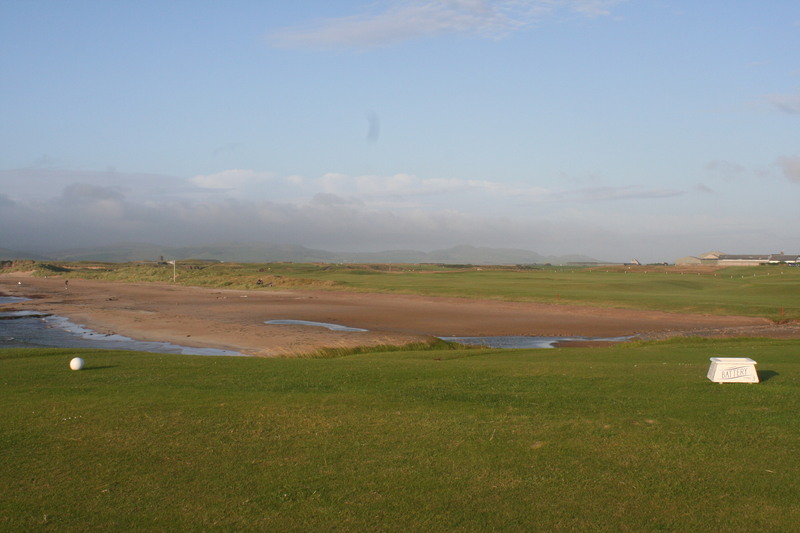 Machrihanish GC is a joy to play and usually very quiet, allowing the visitor to relish the ups and downs of its true links fairways and the tussle with its undulating greens. There are also arresting views across to the islands of Jura and Islay, which provide a delightful backdrop on an idyllic summer’s day, with the firm Machrihanish turf underfoot, the majesty of the dunes all around you, and wheeling seabirds above providing the only sound. The course is a varied test for the competent golfer – the layout is not just a predictable nine out, and nine back. The classic links holes – apart from the 1st – are the 5th, another par 4 with its fairway like an elephant’s graveyard; the 10th, a clever dogleg-left par 5; and the 15th, a one- shotter that presents real difficulty if the elusive green is missed from the tee. A perennial fixture on the World Top-100 lists of many golf magazines, Machrihanish Golf Club has been a favorite destination of links golf devotees ever since Old Tom Morris was hired to extend the links to a full 18-hole course in 1879. (Kindle Edition) Of the hundreds of golf itnrructoss out there, Darrell Klassen is the best. No band aids in this book. Darrell understands how the human body and subconscious mind wotk together in the golf swing and this book cuts to the chase by providing straight forward information not available from the other pros! Anyone who wants to understand how and why things happen to prevent long, straight drives will find a wealth of information in this book and will certainly want to learn more from Darrell’s instruction. I give this book 5 stars.